Straight out of the West Coast stable of Randy Phillips and Vince Shay the Intruder is a very different surf kayak from all its predecessors. 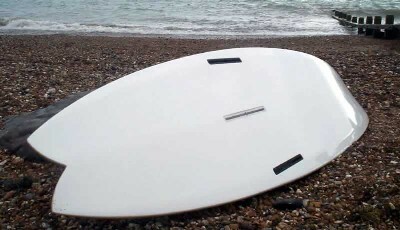 Minimalist hull profile, wider in the tail and seat positioned significantly towards the back the Intruder turns very much like a wave ski, off of its tail. The secondary chine on the hull has been kept to a bare minimum with sharp release rail from bow to stern. Entry rocker in the bow is considerable to facilitate seriously late "take offs", and also makes getting out thru the soup more of a "hop over the top" rather than a punch thru. Tail rocker is minimal and is a very shallow "V" in cross section . This boat is very VERY quick and due to its almost flat hull it is also very stable.